My initial equipment: the left is the handheld radio Hytera 785G, in the middle is the Albrecht AE7500 on a power supply and on the right side is the handheld radio Baofeng UV-5R. Tecsun S-2000 Shortwave Receiver - receives long-wave, medium wave and short wave continuously from about 100 kHz to 30 MHz with AM / FM / SSB, FM radio 76 MHz to 108 MHz FM (also includes the Japanese broadcast band 76-90 MHz) and aeronautical radio 118 MHz to 137 MHz (AM). BAOFENG UV-5R - 2m and 70cm handheld transceiver of a Chinese manufacturer. Bought for 35 euros on the Hamradio - it is small and cheap but ideal to be able to get first experience with relays or direct QSOs at close range. Hytera PD785G - DMR handheld transceiver of the manufacturer Hytera (DMR = Digital Mobile Radio). Very robust device, made by MILSPEC standards. Exactly the same device type is also used in the digital radio network of the Polish police. Works well for direct connections between DMR devices or access to Hytera digital radio network or DMR-MARC digital radio network. Because it did not make any real difference in price, I bought the 785G instead of little cheaper 785, this has also installed a GPS receiver, which I can use for APRS for example (or if I do not even know where I am ;-) ). 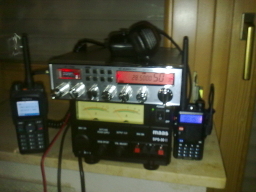 Albrecht AE7500 - This CB radio can easily be converted into a radio for the 10m and 11m band. Then, the performance increased from 4 watts for AM, 4 watts for FM and 12 watts for SSB to 10 watts for AM, 30 watts for FM and 30 watts for SSB. Wouxun KG-UV920P - 2m and 70cm mobile device of a Chinese manufacturer. Provides a relatively large range of functions, it is, for example, full duplex cross-band capability and cross-band repeater capability. I can simultaneously monitor two frequencies (2m/2m or 2m/70cm or 70cm/2m or 70cm/70cm) and listen to them not only simultaneously but rather also send the same time. With a power output of 50 watts in the 2m range and 40 watts in the 70cm range, it naturally has a bit more output power than my Baofeng handheld transceiver with its 5 watts. However, it may not make much out of power at the time, since it is operated on a magnetic base antenna, which stands on a stainless steel table as a counterbalance. Despite these currently less than optimal configuration, I have been consistently get good rapport from a little further away OMs. Icom IC-7100 - A radio with a very wide range of functions. Initially, I wanted to buy a D-Star device for 70cm to experiment with this digital mode. I also wanted to buy later a short-wave radio. However, I was able to buy this radio far below market price via a friendly OM. The range of functions is impressive: it covers the entire shortwave spectrum from 160m to 10m band. Above the shortwave spectrum, the 6M, 4M, the 2M and the 70cm band. The maximum transmitter output power is in the shortwave and 6m range 100 watts; in the 4m band and 2m band 50 Watt; and in the 70cm band 35 Watt. The unit has a remote control panel, which allows you to operate the touchscreen keypad 3.5m away from the radio (or 5m with another cable). Other nice features are, for example, a built-in SWR meter; Settings can be saved to an SD card and the radio is controllable via IP over a home network or the Internet. Antenna - I absolutely need a good, solid antenna at least for the 2m and 70cm band. I currently planned here in the direction of X-30N, X-200N or X-300N manufactured by Diamond Antenna. 10m-Band-Antenna - this is separated because I want to buy anything here. The plan here is to build a bazooka antenna itself, this mono-band antenna is relatively easy to produce from coaxial cable. Pager - In amateur radio there is a Germany-wide frequency for a pager service (more commonly known as pager). For this old public networks pager are rebuilt and used. I plan to get a former Telekom pagers and convert this - instructions can be found on the net enough. C-Netz Phone - I originally had the idea to want to test the digital mode D-Star. When I was looking for a cheap D-Star capable radio, I stumbled upon the conversion of old German C-Netz telephones (for the younger, the analog predecessor of today's mobile phone networks, which are the car phones, you sometimes see in older movies) - this equipment you get cheap (partly still in original packaging) and then can relatively easily converted into an analog 70cm amateur radio. With an additional circuit board the radio is upgraded to a D-Star enabled device.